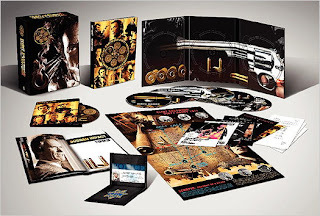 Warner Brothers has finally released the details for the forthcoming special edition of Dirty Harry, as well as the deluxe editions of the other films in the series. All of the films will be released separately as well as in a special seven-disc set entitled Dirty Harry: Ultimate Collector’s Edition. Each of these will be released on June 3rd. *New Commentary by Richard Schickel — Filmmaker and Eastwood biographer Schickel examines the landmark film that revolutionized cinematic crime drama for all time. *New Featurette The Long Shadow of Dirty Harry — An examination of the influence and legacy of Dirty Harry. *Featurette Dirty Harry: The Original — Clint Eastwood and the film’s creators look back at the birth of the modern action hero: Dirty Harry. *Featurette Dirty Harry’s Way — A promotional short on the movie Dirty Harry focusing on the toughness of the movies’ main characters. *Interview Gallery — Includes interviews with Patricia Clarkson, Joel Cox, Clint Eastwood, Hal Holbrook, Evan Kim, John Milius, Ted Post, Andy Robinson, Arnold Schwarzenegger and Robert Urich. *1993 TV Special Clint Eastwood: The Man from Malpaso — A look at the life and career of actor/director Clint Eastwood, including scenes from his past film and television work and interviews with friends, fellow actors and crew members who have worked with him over the years. *Scorpio Portrait of a Killer poster-sized (19″ x 27″) map of San Francisco detailing Harry’s hunt for the killer and never-before-seen production correspondence. SRP: $129.95 Pricey? Sure, but it looks pretty damn sweet! *New Commentary by director James Fargo Director Fargo takes an entertaining look at the film that launched his career as a director, including the day Clint Eastwood nonchalantly let him know he had the job. *New Featurette The Business End: Violence in Cinema An unflinching look at the ongoing debate on violence in cinema. *New Featurette The Evolution of Clint Eastwood — An examination of the film in the context of Eastwood’s broader career as a director. *New Commentary by producer David Valdes and Cinematographer Jack N. Green, who discuss the challenging and rewarding experience making this the final chapter in the Dirty Harry series. *New Featurette The Craft of Dirty Harry — A look at the cinematographers, editors, musicians, production designers and other talent of the Dirty Harry series.